Next up: the partisan hacks at Snopes fact-check The Onion. BOMBSHELL: Comey Drafted Memo Exonerating Hillary’s Illegal Behavior... Before Suspects Were Interviewed! High-ranking officials at the Federal Communications Commission (FCC) gave left-leaning groups a disproportionate amount of assistance compared to right-leaning groups in 2014, emails obtained by The Daily Caller News Foundation show. The preferential treatment transpired during a period when the public could post comments on the FCC’s forum for the net neutrality debate. Both major sides of the policy battle rushed to post as many remarks as possible in an attempt to show its viewpoint was more widely held. But some employees at the FCC worked overtime to tip the scale in favor of proponents of net neutrality by constantly accommodating and communicating with groups like Fight for the Future and other members of the larger coalition known as Battle for the Net. Larwyn's Linx: Shouldn’t Participating In Antifa Terrorism Get You Fired? Reminiscent of his presidency ("Obama’s refusal to interrupt vacation amid Louisiana flooding stirs anger"), summer intern Biff Spackle* snapped these photos of Barack Obama visiting Houston. The former president -- as could have been predicted -- offered comfort, money, and much of his time to assist the victims. Hahahhahahhahahahhahahahahahah *cough* hahahhahahahahahahhahah *wheeze* hahahhahahahhahahah *choke* hahahhahahahah *agh* hahha --- owww. I think I just wrenched my nimbus muscle. In Berkeley, Boston and San Francisco, the First Amendment doesn’t exist anymore. The threat of violence that shut down the Patriot Prayer demonstration in San Francisco, an event scheduled to feature African American, Samoan and Latino speakers, is a case of fascism justifying itself by flying the false flag of “anti-fascism.” And it is the third such case this week – the others being Boston and Berkeley. President Trump Is 100% Right – The Media’s Feeding Hate And Division: Wow! “El tonto Trudeau” and not so happy Canadians: Silvio Canto Jr. 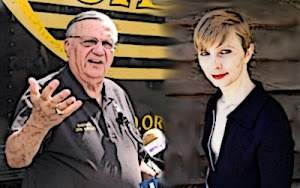 The temper tantrums on the left over the well-deserved pardon of 85-year old ex-Sheriff Joe Arpaio (convicted on a misdemeanor charge of contempt) deserves some context. Over the course of eight years, Barack Obama pardoned scores of hard-core offenders. Predictably, many committed crimes after being pardoned. Riddle: What does a Democratic National Committee member say the moment he wakes up from a sound sleep? Consider the DNC's latest pathetic ad campaign, which reads: “If Trump wants us to believe he does not support white supremacy, tell him to fire the enablers of white supremacy working for him in the White House.” What's remarkable is that while the imaginary “white supremacy” of Trump's aides and advisers makes Democrats squawk with fiery indignation, the DNC not only countenances a number of very real, impossible-to-miss racial supremacists of its own, but it actually celebrates and honors them. North Korea Has 1.2 Million Troops But Cannot Feed Them: Yahoo! People who have never visited Arizona are experts on my former sheriff. Preparations and evacuations are currently taking place along the Gulf of Mexico as Hurricane Harvey — now a Category 4 storm — readies to slam into the Texas coast. The United States has been mostly spared from any major hurricane damage in recent years considering the last time a major (Category 3 or higher) hurricane made landfall in the continental U.S. was in 2005 when Wilma wreaked havoc on Florida shortly after Hurricane Katrina decimated New Orleans over 4,000 days ago. But this time around, the sensational claims from meteorologists and media outlets alike may have more credibility. In a thoughtful analysis at Dystopia, a surprising assertion is made. Executive summary: President Trump has carefully executed a magnificent sting operation against the so-called "Deep State". Why has the Beltway political-media complex dropped the Russian collusion story like a hot potato? Why have all several hundred white nationalists and Neo-Nazi kooks in the entire country suddenly received national attention after 40 years? Also: why are historical statues that have gone unnoticed for a century suddenly a controversial issue? And -- most importantly -- why has the media ignored the greatest presidential feat in history, when President Trump was able to stare directly into the eclipse without blinking or damaging his magnificent eyes? Editor's Note: Below is a letter that the David Horowitz Freedom Center’s legal team sent to CNN on August 21, 2017, regarding their publishing of an article, The Southern Poverty Law Center's list of hate groups, on August 17, 2017 (updated on August 18) listing the Freedom Center as an SPLC designated hate group. The SLPC’s “hate map” is a malicious and defamatory attack that deliberately crowds together neo-Nazis with the conservative political organizations it opposes. CNN has attacked freedom of speech and exposed itself to legal consequences by running the SPLC’s smear. And the Freedom Center won’t take it lying down. Larwyn's Linx: First Amendment in Peril? Stop Neo-Nazis using this one weird trick!